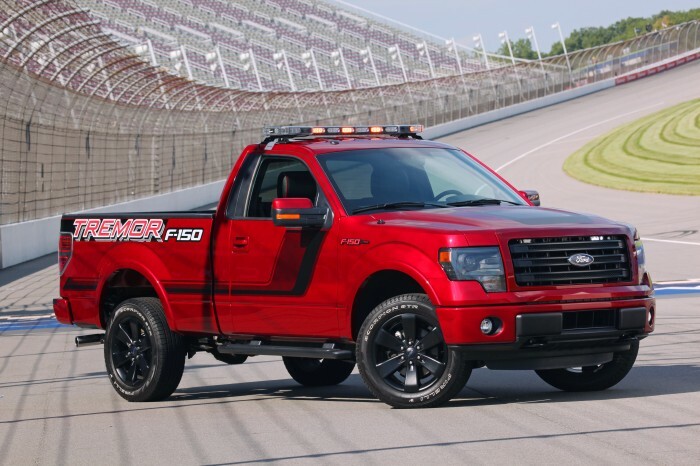 The 2014 Ford F-150 Tremor is all new for 2014. The Tremor features a short-wheelbase, a regular cab, and delivers a sporty, distinctive appearance with its custom-inspired FX Appearance Package. The custom look features bold flat black accents, including 20-inch flat black wheels, stylized body graphics, and black badges with red lettering. The Tremor gives purchasers a performance truck with features that are usually only found in after-market sales. The Tremor is powered by a 3.5-liter EcoBoost engine which puts out 365 hp and 420 lb-ft of torque. Also featured is twin independent variable camshaft timing which improves performance and fuel economy. EPA estimates 16 mpg city and 22 mpg highway fuel efficiency. Able to go from 0-60 in under 6.5 seconds, this performance street truck can move. The Tremor is the first-ever EcoPowered sport truck, capitalizing on many truck-enthusiasts desire for a high-performance V8 with the improved fuel economy of a V6. The Tremor is the only F-150 to offer a flow-through center console and bucket seats. The interior also features black leather seating with red piping detail, brushed metal accents, and a red-stitched steering wheel. The MyFord Touch infotainment system powered by SYNC comes standard, keeping drivers connected. The Tremor comes standard with AdvanceTrac® with RSC® (Roll Stability Control™), Safety Canopy® System, dual-stage front airbags, SecuriLock® Passive Anti-Theft Engine Immobilizer System, SOS Post-Crash Alert System™, and Four-wheel ABS, making this a truck you can feel good about driving.